Reglin Premium Rubber Strips and Pads are an ideal solution for creating an isolation between rigid construction materials in steel joints. 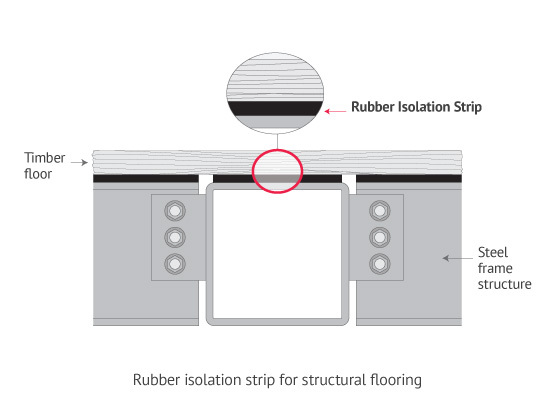 By installing a rubber bearing strip you convert a rigid steel construction joint into a sealed, more flexible joint allowing for movement and noise reduction of building materials particularly flooring without effecting structural stability. Many building materials used in the construction industry for framing, such as concrete, steel and timber are very unyielding. Rigid joints are created between these materials when inflexible fixings and fasteners such as bolts, screws or nails are used to connect to these surfaces. The varying shrinkage, expansion and contraction characteristics of these different rigid materials, as well as natural movement under load and external forces like ground vibration, soil composition or wind require some movement throughout the joint to stop potential damage or cracking happening to the building materials or structure itself, as well as a range of other issues such as noise transmission and weatherproofing. Imperfections in the surfaces of these rigid building materials also create unplanned joints, which do not maintain an even surface contact, potentially leaving higher than designed point loads between structural elements within the joint. This also exposes the joint and leaves the joint unsealed, allowing for exposure to unwanted environmental conditions such as moisture, heat or oxidisation, which potentially causes damage to building materials or the structure itself. Why Use Rubber? Rubber (natural or synthetic) is versatile and pliable, flexible and has high elastomer characteristics, which make it the ideal solution for use as a flexible joint and load bearer in building construction. Reglin suggests that customers obtain a thorough understanding of the mechanical properties and compounds of these rubbers in order to select the appropriate product which will be ‘fit for purpose’ for your project. There are numerous opportunities where Reglin premium rubber can assist with rigid construction joints. 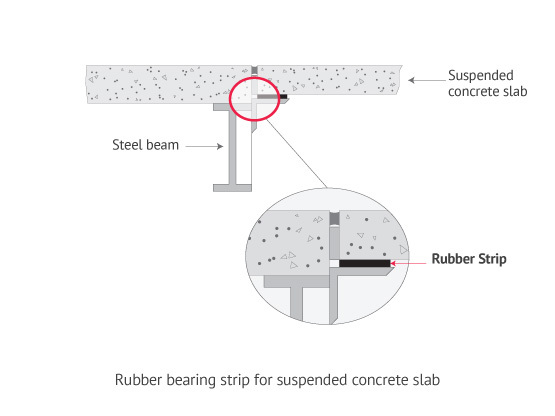 Here are 3 illustrated examples to show how rubber is able to assist with flexible bearing, for stability and isolation. 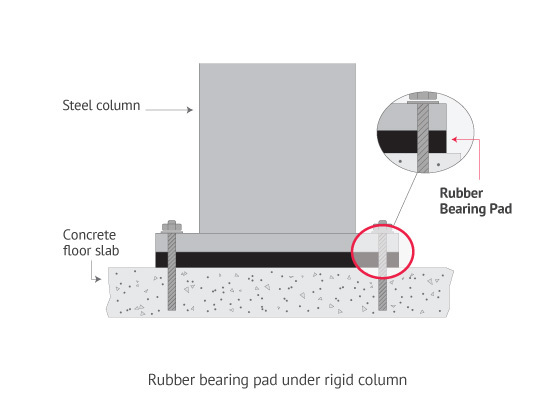 Installing Reglin’s premium grade rubber bearing strips and pads such as Neoprene 60 HG can create a flexible construction joint, which performs as an insulating layer between rigid building materials. This allows movement between the two different building materials when they are fastened together with fixings, as well as creating a seal between them. This can also can prevent noise transmission and potential damage from environmental conditions such as moisture, humidity and heat. When selecting materials for construction, there are some important factors and criteria to take into consideration when deciding upon the right rubber joint solution. These factors include durability, length of life cycle, sustainability performance, health and safety, ease of installation, availability of the materials etc. These all need to be considered so you make the right choice. Reglin Premium rubber products are very durable and are an ideal solution for use as bearing strips and pads due their high flexibility and great bearing ability combined with a wide range of technical physical properties. Premium rubber compounds can display different physical properties and resistances, which are able to align with the various needs of your construction joints. Reglin is able to offer reliable solutions for long lasting performance, which can be specific to the application requirements for the construction industry. You can read about Reglin Neoprene 60 HG, used as bearing strips in the case study, tab here. Reglin premium rubber products display good load bearing capabilities due to excellent physical strength and high elastic properties (elastomeric). Reglin premium rubber products are highly durable and can display good resistance to water, weather, ultraviolet (UV) and a range of chemicals and petroleum-based fuels and oils. Reglin premium rubber products have high tensile and elongation properties making them extremely flexible and able to withstand tension under movement. Reglin premium rubber products are compressible under load and also have a good compression set, allowing them to recover after prolonged exposure to compressive loads. Reglin Rubber supply premium rubber in rolls, custom cut strips and pads to ensure easy installation and to suit the particular requirements of building construction. For more information on our range of premium rubber product, please follow the links to the rubber products directory of the website.